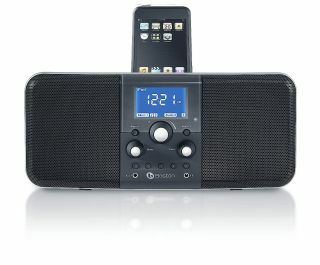 Boston Acoustics has announced the arrival of its first iPod dock in the UK – the Duo-i. Designed primarily as a lifestyle bedroom player the dock features an in-built AM-FM radio tuner with alarm and snooze functions. The unit offers 10 memory presets for FM stations and five for AM. Performance-wise the Duo-i boasts two 3.5-inch speakers with BassTrac Bass Boost for extra low-end, plus a front-mounted 3.5mm jack for other MP3-in and headphone-out. Boston claims this is enough to produce a “room-filling” sound. Aesthetics are also catered for with a selection of coloured speaker grills that can be mixed and matched according to the décor of the room the unit is being used in. The Boston Duo-i is available on the UK now priced £170. Additional speaker grills cost £15 a pair.